This past weekend I went to visited my parents to spend time on the lake boating, skiing, tubing, and soaking up some rays before summer is really over. But before I left I made some of my family’s favorite recipes from the blog. 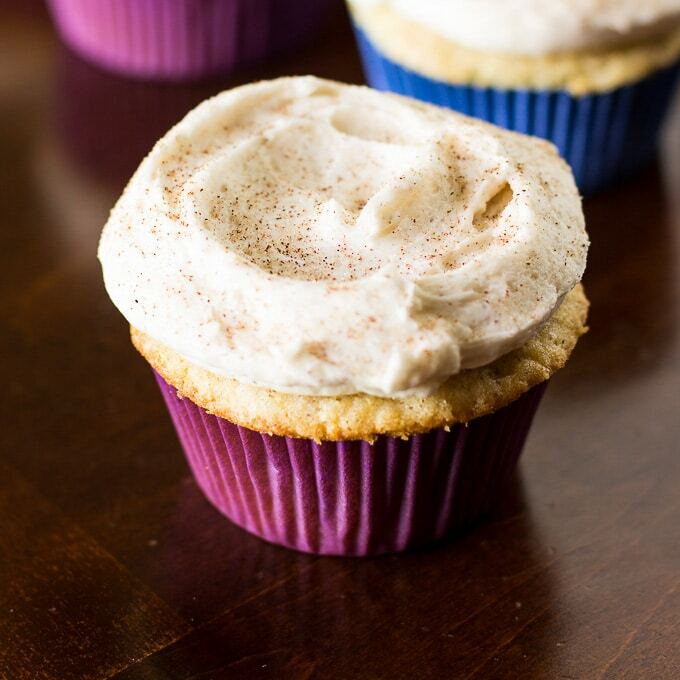 Like my Chocolate Chip Cookies, Cinnamon Roll Funfetti Cake, Taco Dip, and these delicious Snickerdoodle Cupcakes with Cinnamon Frosting! Whew! That’s a lot of baking and after spending all day in the kitchen baking and having fun in the sun out on the lake this past weekend, my skin took a little bit of a beating. I normally only talk about baking, but today I’m mixing it up because I’m so excited about my new favorite beauty products from Vichy Idealia, I just had to share it with all of you. I use the Idealia Serum which smells amazing and absorbs instantly. It makes my skin feel smoother, look brighter, and just have that healthy glow to it. I also use the Idealia Eyes, it works miracles on dark circles, which is perfect for a food blogger like me who wakes up in the middle of the night because I thought of a new delicious dessert recipe! 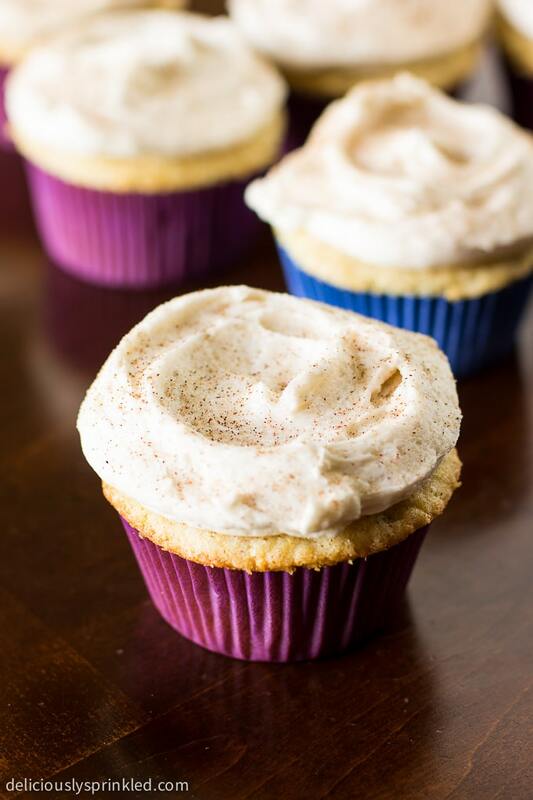 And speaking of desserts, these Snickerdoodle Cupcakes are not only a family favorite but also a favorite with all my readers! So I thought now that my skin has had a complete makeover, thanks to Vichy Idéalia, these Snickerdoodle Cupcakes also needed a makeover from the ugly photos I took of them when I first started blogging, yikes! In large bowl, beat shortening with electric mixer on medium speed for 30 seconds. Gradually add sugar. Add eggs, one at a time, beating well after each addition. Beat in vanilla extract. Slowly add flour mixture, and milk and mixing until just combined. DO NOT OVERMIX! Pour the cupcake batter into the cupcake liners (about 3/4 the way full). Bake 18 to 20 minutes or until toothpick inserted in center comes out clean. Allow cupcakes to cool before frosting. Add powdered sugar, heavy whipping cream and vanilla extract. Increase to high-speed and beat for 3 minutes. Add more cream if needed for spreading consistency. Mix in ground cinnamon. Frost cupcakes using a piping bag or knife. Sprinkle top of cupcakes with cinnamon-sugar. 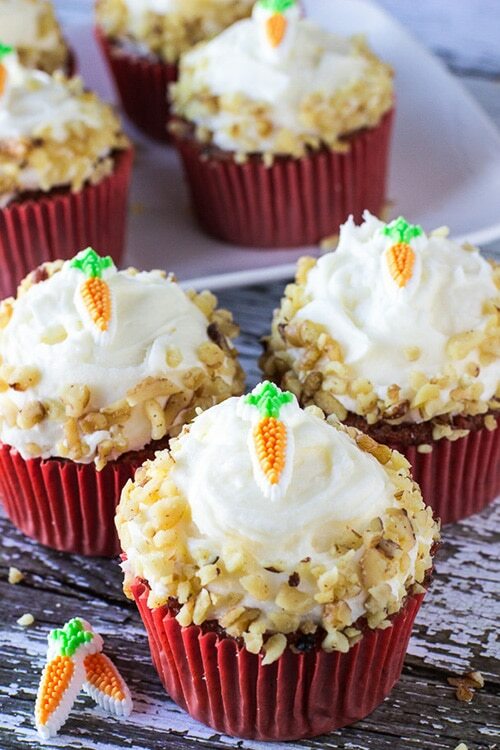 Try another reader favorite next, Carrot Cake Cupcakes! Hi there! This may be a silly/commonsense question, but I want to make a smaller “test” batch before my son’s birthday party. If I just half the ingredients, will it mess anything up? Would this mixture fit in 9×13 cake pan instead of cupcakes? The frosting recipe calls for a tablespoon of cinnamon, but I don’t see it in the frosting directions. Am I missing it? Thanks! Frost cupcakes using a piping bag or knife. Do you have an advice on what I would need to do to adjust for high altitude? Thanks! I wish I could help you out but I don’t know anything about high altitude baking. I did find this awesome chart from King Arthur Flour http://www.kingarthurflour.com/recipe/high-altitude-baking.html. Hopefully this chart will help you when baking my Snickerdoodle Cupcake recipe. I made these cupcakes, they are delish and were a big hit. But I followed the directions for the frosting to a T and my frosting looks nothing like yours, I wonder why. I’m glad everyone love the cupcakes. But can you tell me a little more about the frosting…was it too thick? too thin? Let me know and hopefully I can try to figure out what went wrong. Snickerdoodles are a huge favorite around my house – these cupcakes would be a big hit with the family! 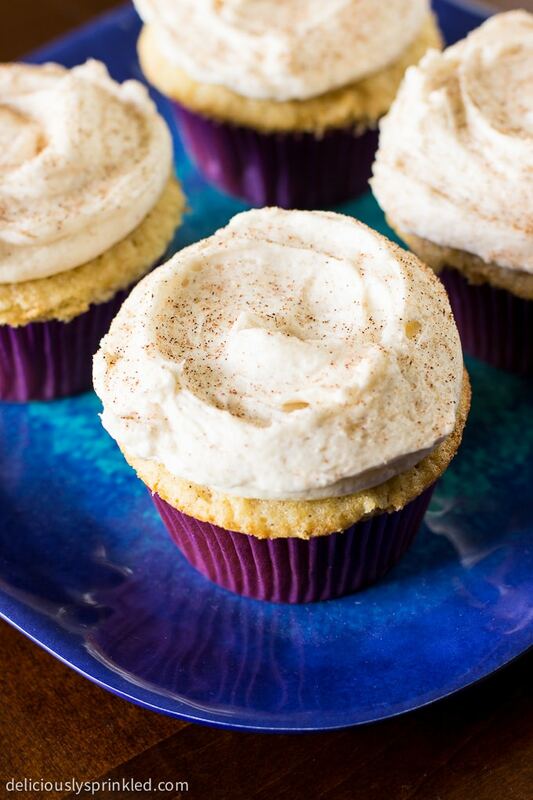 I love snickerdoodle cookies, but I have a feeling I would love these cupcakes more! Love that cinnamon sugar topping! My family does the same thing when we get together! They request a million different recipes! What a great way to celebrate the the “beginning of the end” of summer, and these cupcakes! I need them! Pinned! I love being out on the water. It’s so relaxing! These cupcakes are calling my name. That frosting… Yum!